Home » News » EU E-Cigarette Ruling To Be Overruled? Policy makers at the European Parliament have recently voted to ensure electronic cigarettes are not to be regulated as a pharmaceutical or medical products. A welcome and sensible ruling for European manufacturers and vapers. However the EU decision is clearly at odds with the plans of the MHRA in the UK and could lead to it being overruled in the future. The European Parliament established that e-cigs can be regulated as medical products if their manufacturers claim to cure or prevent smoking addiction, something the Medicines and Healthcare products Regulatory Authority (MHRA) criticised as it wants nicotine vaporisers under scrutiny similar to nicotine patches, gums, and mouth sprays. It has already invited manufacturers to voluntary regulation in June, as the UK believes “medical regulation of NCPs (nicotine-containing products) is the best way to deliver a benefit to public health,” according to a spokesman. They are planning to make this point during negotiations and to maintain the lowest recorded smoking levels in England, now pegged at 19.5 per cent. The UK electronic cigarette industry warmly welcomed the EU policy. They are currently in talks with the Advertising Standards Authority regarding the bans on e-cigarette advertising and disagree with the MHRA in regulating the e-cig as medical products because of its expensive licensing process. 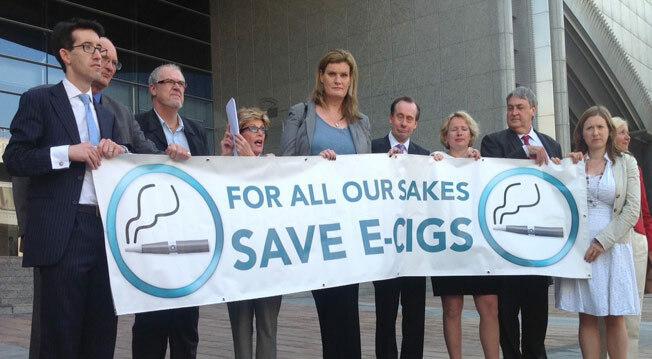 Martin Callanan, the Conservative MEP for North East England, thinks that getting e-cigs out of reach of people who need it is “crazy.” Katherine Devlin, president of Ecita, the e-cigarette industry association, said that the decision of the MEPs not to favour regulation of e-cigs as medicine is highly significant. Health executives and the major players of the e-cigarette industry in Britain are unsure what impact this regulation has on nicotine vaporisers, such as whether they are also exempt from sponsorship and promotion in sports events akin to tobacco companies. The latest policies on tobacco regulation in the EU also required two-thirds of the cigarette pack to contain health warnings and eventually ban menthol cigarettes by 2022. The UK has deferred the decision whether to follow Australia’s lead in introducing standardised packaging.